So, I’ve decided to continue this little series to let you all know about a new method I’ve been trying out for the past 7 months or so…the “no poo” method. It took me a while, but I’ve figured out a way to make it work for me and I love it. I’m not saying that what I do will work for everyone, because that’s just ridiculous. But hopefully by sharing my adventure into no-shampoo-land with you, you will be able to find a formula that works for you too! Aloha, friends! I know I posted a short little spiel on hair care not that long ago. This is virtually the same basic info, written in a more clear and concise manner and with more external links to aid in your personal research And I included info on hair types! enjoy! Your hair. It’s been with you most of your life. But even though it hangs out with you every day…you might not actually know much about it! It’s important to be well-acquainted with your mane so that you can know how to properly care for it. I just classified my hair using the guidelines they’ve set up over at LHC. I’m a 1b/c, M, ii/iii. Don’t worry. This didn’t make sense to me at first either 🙂 It has to do with how wavy your hair is, the thickness of each individual strand, and the thickness of all of your hair, all together. So basically, I have mostly straight hair with slight waves, medium-thick strands, and I’m on the thicker end of what is considered “normal” hair. This article explains it all! These classifications can help you learn how best to care for your specific type of hair. You can even search for people who have the same or similar hair classification on the forum and see what they do to care for it! The main issue with keeping your hair healthy though, is determining what your hair needs. Hair problems/unhealthy hair is usually caused by either a lack of protein, lack of moisture, or product buildup on individual hair strands. This article describes a clarifying wash method and diagnostic tips for building a routine to help your hair thrive. DISCLAIMER: I’ve built a routine based on adding moisture to my hair. I might be wrong. This might not be the “best” method – but it works for me and my hair is usually happy, healthy, soft, and shiny. If you do not care to change the products you use, you can still have healthier hair by adapting your routine slightly! Even before I started using these products and methods almost 1.5 years ago, I still had soft, shiny hair. I used Garnier Fructis Length&Strength shampoo and conditioner religiously, but still had good results with any other shampoo/conditioner I used. All that I really did differently was make sure to wash and rinse my hair in COOL water. Hot water can be damaging to the cuticle of your hair. I would also wash and condition my hair at the beginning of my shower, and leave the conditioner on until the end of my shower. Those few extra minutes make a huge difference 🙂 I also did not rub my hair in my towel when drying it, I would squeeze the water out in sections instead. It works just as quickly and keeps your follicles from being damaged! Here is my hair care arsenal! 1 – TreSemme Anti-Breakage Shampoo and Conditioner. On Walmart.com, they’re $3.50/bottle. I never pay much more than that in-store either. I use the Condition-Wash-Condition method – Described HERE, under the “Getting Started” headline. 2 – Brush Strokes Two-Sided Boar Bristle Brush. On sale for $1.99 on Sally Beauty Supply’s website [click the link], and I didn’t pay much more for it in-store! Boar bristle brushes don’t have the harsh edges that plastic combs and brushes do, which can actually tear your hair apart (quite literally). 3 – Apple Cider Vinegar. I use it to do a rinse a couple times a week. More on vinegar rinses here. 4 – Hair scissors. I really need better ones…good scissors make all the difference! Hair scissors are sharper than your average pair of Fiskars, so they can make a clean cut without catching your hair and creating more split ends in the process. Check out Sally’s Beauty Supply or other beauty suppliers if you’re looking to purchase your own! I trim split ends whenever I see them (usually a few times a week) and will trim 1/4-1/2 inch or so every 6ish weeks. I always trim my own hair, my methods aren’t very precise, but it never looks bad! If you’re not afraid, go ahead and try trimming your hair yourself 🙂 my philosophy: if you always cut the same amount of length off of each strand (or group of strands) – it will look the same when you’re done! Also, have someone look at the back for you and help you keep it straight. Haha. 5 – Extra Virgin Olive Oil. If my hair is ever feeling excessively dry, I will liberally coat it in olive oil, pile it on top of my head (usually in a twisted bun), and wrap my head with plastic wrap (to retain moisture and heat). Let it sit for 30 minutes, hop in the shower, shampoo my hair twice, and it’s good to go 🙂 I only do this about once a month. 6 – One ‘n Only Argan Oil Treatment. $10 for a 3.4oz bottle on the Sally’s website. I use this daily. After I’m out of the shower and have towel-dried my hair, I will put a few drops in my palms and run them through my hair (concentrating on the ends). Careful not to use too much, or the buildup will cause your hair to tangle even more easily…I’ve made the mistake of trying to use this to smooth tangled ends if I haven’t washed my hair for a few days. Bad idea. More on the benefits of Argan Oil here. 7 – TreSemme Thermal Creations Heat Tamer Spray. Drugstore.com has it listed for $4.75 per 8oz bottle, it’s not on Wal-Mart’s website but I know I bought it there for cheaper. I use this liberally every. single. time I blow dry, curl, flat iron my hair! Heat can be extremely damaging, and I can tell the difference when I use a heat protectant and when I don’t. My only caution: using this spray does cause buildup on your hair, make sure you clarify after using copious amounts of it. I definitely do not wash my hair every day, because I can get away with it. I don’t have a naturally oily scalp, and I wear my hair up [in a bun] a majority of the time to protect it from damage. I probably wash my hair every 3 days. There are a lot of different theories about whether washing your hair more is actually bad for it…I’m just lazy and if it looks and feels fine, I leave it alone. I also braid my hair every night before going to bed in order to minimize damage while sleeping [I toss and turn a LOT]. Either that, or I’ll twist it into a bun on the very tippy top of my head so it’s out of the way. I just joined the Long Hair Community Forums for real today, so I’m going to be re-evaluating my routine and posting the results for you to see in the coming weeks 🙂 I’ll pass on any cool tips I can find, and I highly recommend wandering around the discussion boards yourself if you’re really interested! And as always, if you have any specific questions or want to talk about anything, just ask 🙂 either in the comments, or you can email me! wafflesandcereal [at] gmail [dot] com! UPDATE: upon further review, I have decided that my hair is actually a 1a/b waviness and definitely a ii thickness. Also, I forgot to put hair pictures up, so you can see the results! This was taken after washing my hair with the methods described/linked to above – including an Apple Cider Vinegar rinse and Argan Oil treatment – then allowing it to air-dry. 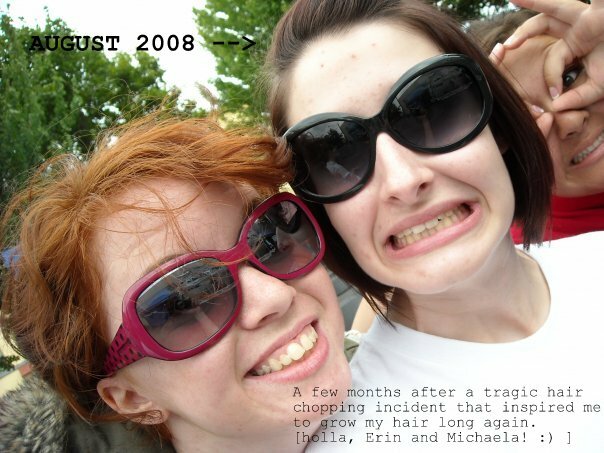 From August 2008 – September 2010, my hair grew approximately 8.5 inches. 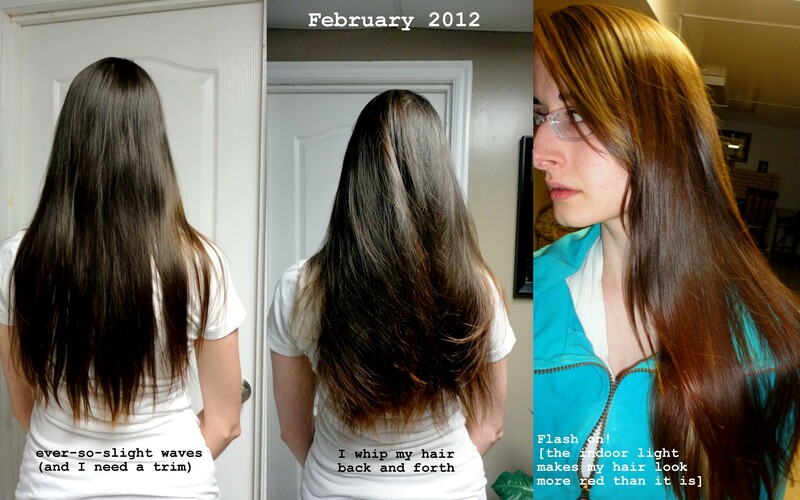 From September 2010 – February 2012 (AKA since changing my routine), my hair has grown approximately 11 inches. That’s about 2.5 inches more growth, in 8 less months! Evidence that this stuff works, yo. My spiel on hair care. 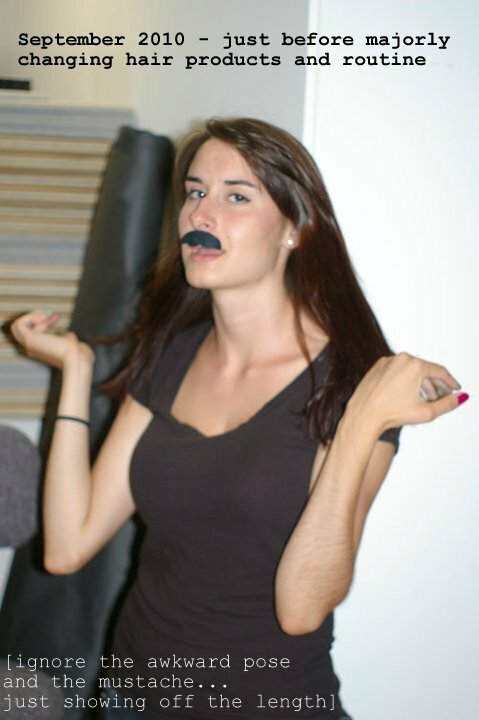 Sometimes I think about being a beauty blogger. But sometimes I really just want to share some tips with people. Because they work, and I like things that work! 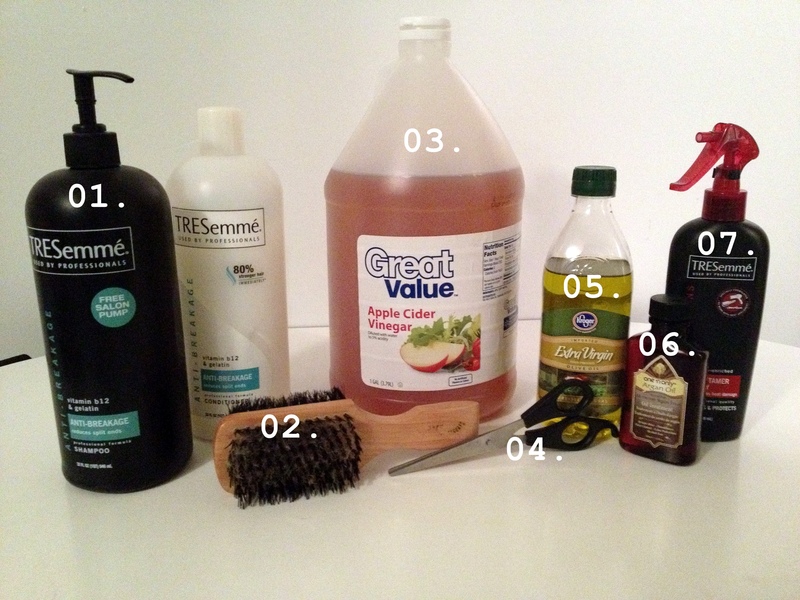 So…..here is my spiel on how to care for your hair and make it happy!